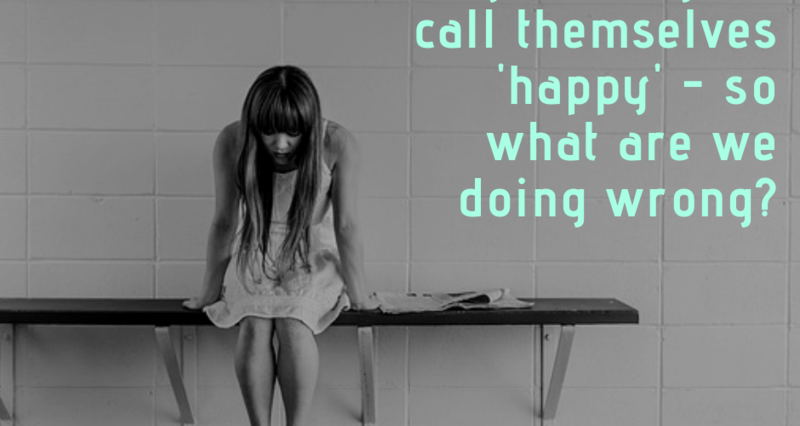 Only 1 in 4 girls call themselves ‘happy’ – so what are we doing wrong? I don’t take a paper. I mean, I barely have time to read my own name on an envelope, so working through all the many articles contained in a broadsheet is a luxury belonging – for the moment, at least – to another existence, one where I’m not permanently covered in PVA glue. You can read the full story here – but, to summarise, a recent study has found that only one in four girls aged 7-21 describe themselves as ‘very happy’. I asked my daughter, barely two weeks into this age bracket, whether she felt happy. “What – now?” she replied. It’s fair to say I don’t have a lot of ‘deep’ conversations with my daughter, whose idea of a disaster is forgetting to bring her unicorn squishy to bed. Of course I was mildly relieved by her answer, but I’m not resting on my laurels and giving myself a parenting trophy just yet – she still has adolescence and young adulthood to come, and the wheels may yet come unstuck. Is there anything I can do, as a mum, to prevent this? To answer, I need to go back a few stages and ask why this story bothers me so much. Why do I care that lots of girls are unhappy? Primarily because it feels like feminism is failing. We are trying so hard to ensure girls are able to access what boys can in terms of opportunities, jobs and family life, and yet we’re failing to enable them to access lives which are happy, content, low in stress and enjoyable. Does this seem slightly off-balance to you? The media thinks people like me, who choose to stay at home for their children’s preschool years, are a failure. The statistics say that I’m a bad example to my daughter, who is less likely to have a well-paid job, and more likely to make the same waywardly irresponsible decision I’ve done, if she ever has kids. I disagree. Or maybe I agree, but I don’t think it matters. What’s the good in having a well-paid job if you’re not happy? What’s the good in a glittering career if your mental health is in a poor state? I mean, you can do both, right? It is possible to be simultaneously successful and happy. And having a stay-at-home parent is by no means a guarantee of future happiness. But if such a high number of the 7-21 age group are describing themselves as ‘unhappy’, I’d wager that a decent proportion of the 21-35 age group are struggling too – and that means we need to rethink some of the identity information we’re feeding to our daughters. I’d love my daughter to do well professionally – and, trust me, I’ll be her biggest cheerleader in this – but at the expense of her happiness? Not a chance. We need to hear more feminists validating girls simply for being who they are, not endlessly needing to achieve more than the generation before them. The two major reasons girls cited for their unhappiness were exams and social media. Let’s look at exams first. Please forgive me for the gender generalisations – I know this doesn’t apply to all girls, everywhere – but, on the whole, girls get more anxious, care more what others think, and take what others say more to heart than the boys around them. As I said – not every girl is like this, but then we’re not talking every girl – we’re talking about 75%, so hear me out. Teenage girls don’t need to be told how important their exams are – they’re already far too aware. Every time you mention a deadline or an exam, they take it on board and their stress goes up a notch. Teenage boys, on the other hand, could be repeatedly told how much work they still needed to complete, and the short time frame they had in which to do it – and still they would choose video games over coursework. Every time. They’re just not that fussed – and, at this age at least, they don’t tend to have as much personal motivation as girls. I’ll repeat my caveat: this is not all teenage boys. But, when I was teaching, this described a majority of the boys in my classes. And there’s another aspect at play. I wonder whether girls are a little more conditioned to work hard at school, because we’ve grown up being told to believe in ourselves, yet aware of a history which has trodden us down, dismissed our views, and diminished our achievements? Deep-down, we feel like the underlings (even though we know we’re not), and that gives us a drive – sometimes a desperation – to put our all into school exams. Again, this isn’t true for every girl – but I think, with hindsight, that this might have been me at school. Girls usually outperform boys in school exams – but it’s boys who end up with the higher-paid jobs in adulthood. So clearly school exam success is not an indicator of future life success. There are multiple factors, many circumstantial, that propel someone into a well-paid or high-level job. Most girls won’t be told this, though. Our high level of personal motivation, as well as our ability to enjoy intrinsic rewards, mean that we want to do well for ourselves – not just for the glitzy job waiting for us in our 20s. The other chief cause of girls’ increasing unhappiness is social media. As the report says, “Relationships are an essential element of contentment and it may be no coincidence that 10 years ago, girls of all ages were socialising more and comparing their lives online less”. If you want a statistic to go with that, in 2009 69% of girls met up with their friends at each others’ homes, compared with just 21% in 2018. It’s not rocket science, is it? If you replace real, deep, committed, do-anything-for-each-other friendships with shallow, image-based liaisons through Instagram and Facebook, who are you going to unwind with, offload onto, rant at? Pent-up feelings will just increase your anxiety and stress, and decrease your overall contentment and happiness. So, the million dollar question – can we do anything about this? I don’t speak as one experienced in the ways of hormonal daughters, but – never one to withhold my opinion when there’s an opportunity to inflict it upon others – here are some thoughts anyway. Please add yours in the comments. Encourage a healthy attitude towards exams. Offer perspective. Speak of the future. Allow adult family members and friends to share their stories of school success and failure, and how their lives have turned out positively, especially if school wasn’t always a positive experience. Encourage hobbies and interests from a young age. It’s no good trying to persuade your 15 year old to take up judo at the start of Year 11. Start young: let your girls (and boys) explore different hobbies, so that they learn how to relax without the requirement of a screen, and also so that they know where their strengths lie, if not in academia. Have clear boundaries for phone use/screen time. You can find ‘contracts’ all over the Internet intended for parent and son/daughter to agree and sign, regarding phone use. It’s pretty much impossible to control everything your child sees or hears online, but you can at least help them to set healthy boundaries in terms of usage so that they don’t get burned. Make it easy for your daughter to socialise. Build friendships from birth. Teach the importance of loyalty and kindness, and how we repair friendships after disagreements (particularly important for girls). Have an open home to her friends – let her know she is always welcome to invite them round for actual, meaningful interactions. Don’t spend so much time instilling your own dreams in your daughter that you squash her ability to develop at her own pace. We need to stop pushing our daughters towards greatness, and start spotting where they shine, where they’re happiest, and encourage them in that. We can do this from birth, and it pays dividends in the long term. Encourage healthy body image. Let her see your own flawed body. (Sorry, no offence. But it is. And so is mine.) Talk about ‘staying healthy’ rather than ‘losing weight’. Shield her from your own obsession with image, if this is a problem area for you (or talk together about battling it). Do things as a family. If family habits are forged early on, such as eating together, taking Saturday day trips, or playing board games, this gives your daughter a solid base from which to explore the world. Our ability to relate to others come first from our relationship with our parents, so invest your time wisely. It’s not the occasional ‘deep chats’ which build a parent-child relationship, it’s the regular hanging-out, the silly and the absurd, the laughter and the not-doing-much. Don’t blame yourself. Exams and social media might be the biggest two factors in unhappy girls – but they’re not the only ones. And you can’t protect your daughter from everything. Neurology, friendships, school environment and many other factors can play a part in a child’s mental well-being. If your daughter is struggling, don’t beat yourself up about it – but do try and get as much professional help as you can. Brushing issues under the carpet is no place to start. Over to you – is there anything we can do to change this ‘unhappy’ generation? #shetoo – Can I protect my daughter from being a victim? And don’t forget to sign up to my wonderful Desertmum community, with weekly emails about all things parenting/faith/adoption/exhaustion. It’s ace!